Type II reaction centers (RCs) have two acceptor quinones that act in series. The primary quinone, QA, cycles between the oxidized quinone and singly reduced semiquinone. QA is tightly bound to the protein as aprosthetic group. The secondary quinone, QB, is reduced by Q A − , first to the semiquinone and then to the doubly reduced, fully protonated quinol, QH2. QB freely associates with the protein in the quinone and quinol states. The properties of the two quinones that facilitate this process are largely determined by the nature of the two quinone binding sites. Many reaction center crystal structures show these interactions, although there are significant uncertainties in the conformations of the two quinones, and in the significance of the variable location of QB in the protein. Consequently the influence of structure on quinone function is only very crudely understood. 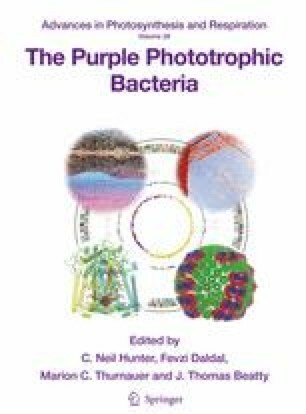 These issues are discussed with emphasis on the quinone reactions in the reaction center from the photosynthetic bacterium, Rhodobacter (Rba.) sphaeroides, which is the best characterized. The structural features of the quinones and their local protein environments are examined in the light of extensive spectroscopic studies, especially by Fourier transform infra-red spectroscopy (FTIR), electron paramagnetic resonance (EPR) and electron nuclear double resonance (ENDOR), on the quinones in their functional redox states.